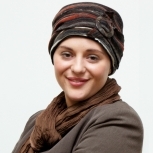 Bea is a stylish chemo hat for hair loss from Suburban Turban. 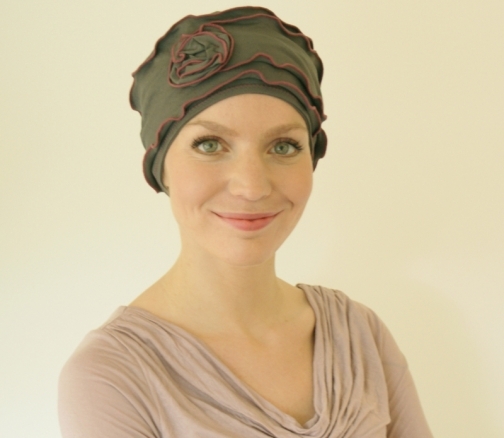 It comes in this super wearable 'Mushroom' soft viscose jersey, trimmed in dusky pink. The jersey is lightweight and the style is cut deep onto the nape of the neck to provide complete coverage for womens hair loss. The flower is hand finished and 'swirled' just off to one side. This neutral and versatile little beanie hat has proven to be one of our best sellers. 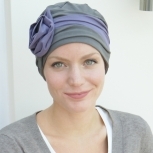 It is a little unusual for a chemo beanie style and an easy one to wear well. More colours are available - Prussian Blue (a lovely jeans blue), Ascot Black/White, Violet Cream/Navy (a pale mauve), Mauve/Midnight (a crushed blackberry mauve! ), Fuschia Red (a real zingy rose red), Copper Olive (khaki green trimmed with bronze thread), and Teal/Navy (a sea green trimmed with navy thread). Please email us if you would like more information. Hat is made from 92% viscose/8% elastane jersey. Hat should be machine washed cool at 30C/86F to maintain fit. No need to press, just shake and leave to dry. We make and size all our hats please leave your size and colour selection IN THE COMMENTS BOX WHEN YOU ORDER. S = 20.5"-21.5", M = 21.5"-22.5", L = 22.5"-23.5" but we can adjust and make to any head size - just let us know your headsize.